In the last year, John Beder has not only interviewed many classical musicians about their experiences with performance anxiety and beta-blockers, but also drafted his search into a cohesive survey for ICSOM (The International Conference for Symphony Orchestra Musicians), which has not addressed musicians and performance anxiety in almost 30 years. On Wednesday, almost a year after initially launching his Musicians' Health Survey and reviewing the data, John shared his findings at the 2016 ICSOM conference in Washington D.C.
K: With those who were comfortable discussing their beta blocker usage, how did they impact their performances, auditions, or other circumstances? J: Throughout the project many of the musicians we talked to about beta-blockers heard about them as the “easiest" and “quickest" way to address performance anxiety. Fast and easy of course sounds perfect when so much time is already consumed by all the other demands of the profession. While we spoke with many people who had positive things to say about the use of beta blockers, many of the musicians we spoke to about beta blockers had a nuanced view of their application. They spoke about them as complimenting a diversity of methods for addressing performance anxiety, rather than using beta blockers to get around more traditional methods of performance preparation. Many had spent a significant amount of time studying how to perform more confidently on stage, beyond the technical and musical demands of performing. Ultimately, beta blockers are not for everyone, and are certainly not a replacement for preparation or some sort of panacea for performance anxiety. This, I think, is the most important take away from any discussion around beta-blockers: that they are a part of a larger conversation about performance skills which is missing from many of our music education programs. K: For those who don't use them, how do they manage their performance anxiety? J: Many of the musicians we spoke to who had not tried beta blockers also invested a significant amount of time figuring out how to address performance anxiety. Many used mindfulness techniques and meditation, while others borrowed from sports psychology with things like heart monitors, biofeedback machines, and breathing exercises. We try to talk about as many of these as possible in the film in addition to beta blockers but with the impressive quantity of approaches we only had time to focus on a few of the most practiced. It’s interesting to note as well that the conversations never started with “I don’t get nervous” since every single person we talked to expressed experiences and instances of performance anxiety. K: Tell me about the Musicians' Health Survey that you launched a year ago and your findings since then. J: It’s been a year now since we distributed the study (2015 Musicians’ Health Survey) to ICSOM and it has been wonderful to see participation from orchestras around the country. A total of 447 musicians responded and some of the results are being shared at this year’s ICSOM conference in Washington DC. Professor Williamon with the Royal College of Music in London is still working on the formal analysis but much of what we learned will be discussed and presented at this year’s conference. Some interesting initial data I can share about the survey is that in 1987 women made up 34% of the respondents whereas our study reported 48% women to 52% men. Today’s classical musician also reported better than average health and there was major increase in physical exercise as a method to address performance anxiety. In 1987 61% of musicians reported regular exercise and in 2015, 68% reported regular exercise. As a means for addressing performance anxiety, however, exercise was used by 17% in 1987 and 74% in 2015, a striking increase. With regard to beta-blockers, the study shows that 72% of ICSOM musicians have tried using beta blockers for performance anxiety. Out of that group, 90% said they would consider using them for auditions, 74% would consider them for solo or featured performances, and 36% would consider them for orchestra performances. By comparison, in 1987 a reported 27% of ICSOM musicians had tried beta-blockers, representing a significant uptick (45%) over the last 28 years. Also in 1987 of those who’d tried beta-blockers 72% said they would use them for auditions while only 4% would use them for orchestra performances compared to today’s 36%. Some other popular methods musicians reported trying included more experience (87%), eating bananas (54%), meditation (49%), and performance psychology (44%). K: How do the survey and your findings factor into your work with the documentary and your work in Musicians' performance health? J: The 2015 Musicians’ Health Survey is really just the start of a bigger conversation we hope to have with our film Composed. We can’t encourage musicians enough to explore performance skills outside of the notes on the page. Musicians are too often left feeling isolated in their struggle with performance anxiety despite the fact that 98% of ICSOM musicians report having experienced it at some point. The statistics here and ones to follow will likely prompt conversations about the beta blockers alone but our goal is not to adjudicate on the use of beta blockers, rather to promote an environment where talking about performance anxiety is accepted and encouraged as part of what it means to be a performer. K: Thanks- I look forward to hearing more about this survey and new findings as the documentary moves towards completion! For most people, the holidays are a stressful time, whether it's because of the flurry of activity, the holiday gigs, the gift buying, or the long encounters with family with questions like, "What will you do with your life/job/relationship/freelance life?." Our body can stay in a place of sympathetic dominance if we're not careful, and our body can get out of whack if left in that state for too long. Here are some of my favorite things to keep it together during the holidays. 1. Get enough sleep. Easier said than done, but all too crucial. Too many days of diminished sleep make me enormously grumpy and dysfunctional. 2. Can't sleep well? Try constructive rest- a practice of introverting your attention and resting for any time. Here's my girl Brooke Thomas' introductory video on constructive rest. 3. While this might not be a good time to start a brand new meditation practice, it's always a good time to breathe and breathe mindfully. I love this chat with Aline Benoit from August to get inspired. Try a few moments of breathing in a quiet place where you can't be disturbed if you feel the pull of holiday stress derailing your sanity. It's ok if a million thoughts come up! 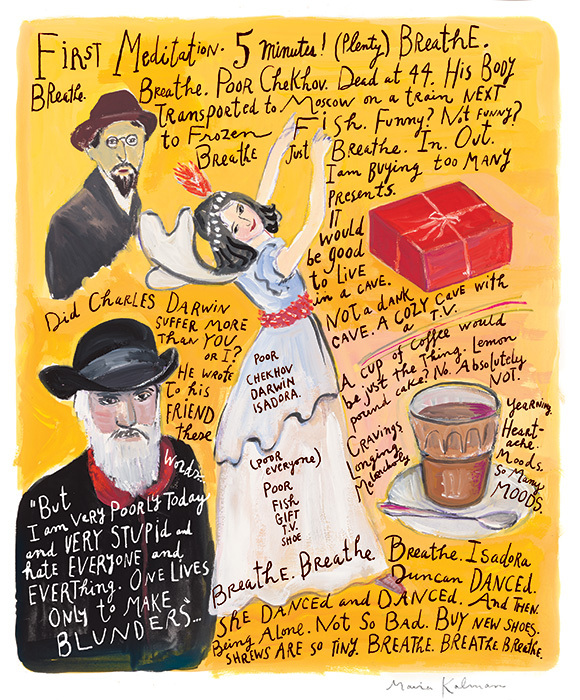 I love Maira Kalman's illustrations on meditation, because she basically details her thought process and how difficult it is to focus. 4. Go for a walk outside if the weather permits. Walking is a critical movement nutrient that is often neglected in our exercise/sitting regiments. I find that my mind is always more collected after a walk. 5. Take a warm bath if you bathtub isn't too gross (or you don't share it with a bunch of people). If you find your body in pain from playing, sitting, or sleeping, a bath is a lovely way to get blood flow into deprived tissues and decrease stress. 7. Do a little self-massage. Even if you only have a tennis ball or lacrosse ball, roll out your feet or your upper back against the wall. A little bit of self-care goes a long way, especially if your feet are trapped in boots or high heels all day. 8. Even if there are many things to stress about during the holidays (relationships, finances, careers, etc. ), take a moment to be grateful for what you do have and consider giving back, even if that's just a donation to a food drive, playing for a senior citizen center, or being kind to shopping clerks. A little bit of gratitude goes a long way in improving morale, even if things aren't the way you wish they were. I am neither for nor against beta-blockers. I just think our culture of perfection is affecting musicians profoundly, and causing a new level of performance anxiety. Choosing to take beta-blockers should be done with an awareness of side affects and contraindications, as well as an awareness that it will only affect physiological symptoms, and do little to change your mental state of performance or auditioning. One of the comments was interesting, "Implying that taking Drugs is great??????? Shocking ending to the article." 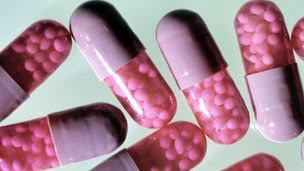 It made me think, "Performers used to drink before performances and auditions- yet taking beta-blockers is stigmatized?" Here's some of my thoughts on the issue, and how my perspective has changed over the years. Modern day classical music has moved to a place of elite virtuosity and a an emphasis on technical perfection and complete 100% accuracy. Anyone who is in the current orchestral auditioning circuit knows this to be true, and often musical intent and sound quality are ranked lower by committees to pure execution of technical passages. (Is this true for every orchestra and festival? Not necessarily, but it is a prominent priority). This is also true in competitions, and sometimes even collegiate auditions. There's a very high emphasis on playing with perfect pitch, rhythm, accuracy, etc., which is absolutely important, but can sometimes go to the wayside under pressure (AKA. sympathetic response). Anyone who has performed or auditioned (without the use of Beta-blockers) knows that things get shaky, breathing can be tricky, and accuracy can be compromised. When committees and conductors are looking for perfection under pressure, performers are left wondering what to do. Some people are lucky to not feel strong nerves under pressure, and other people have debilitating nerves. When a performer spends months preparing for a competition or audition, in addition to spending money on flights and hotels, the stakes get even higher. When our diminishing job pool couples with more qualified musicians, we have a serious problem of too much supply and decreasing (often poor orchestra management too!) demand. The pressure on auditioning classical musicians these days is incredible, and I don't think our art form has ever seen anything like it. Committees have become more and more picky, looking for perfect performance under pressure that often results in no-hires and perpetual vacancies, and many musicians stay on perpetual sub lists because they are deemed worthy to play with the orchestra regularly, but not worthy enough to be given a contract. I find the whole system to be distressing, and I completely understand why people use beta-blockers, to give themselves a better chance at employment. Classical music is not always the most forgiving art form. Many students go to expensive private music schools for either undergrad or grad school, take out loans, and then reach a point where they need to take out another loan for an instrument. If one chooses to take auditions (ensemble, quartet, solo competitions), each audition will cost anywhere from $500-$1000 domestic, and a few thousand if international. Let's assume that many students have $50,000 in debt, and are somewhat unemployed after graduate studies. Students might work a day job (administrative, educational, or retail) to start to pay back loans, and then still try to take auditions in between. The financial pressure alone is intense, and when it combines with a high volume of auditioners and a higher expectation of perfection, there's a volatile and very intense environment. If you put in a lot of time and money to an audition of 7 minutes duration, and you slightly speed something up or play a little sharp from sympathetic response, that's rarely forgiven by a panel. It's the unfortunate reality of our world. I used to be that person who judged others for using beta-blockers. I thought that real musicians could control their nerves and keep calm under pressure (not a fair perspective at all!). There's a view that if one is well-prepared, then one won't be nervous, which is rarely true. I then saw how hard many of my colleagues were working, and how stressed they were, and I started to understand their view. I did not use beta-blockers for auditioning and performing throughout my studies, and I do believe that school is a crucial incubator for learning performance skills (in a relatively low risk environment). I also realize that some people have debilitating performance anxiety, either on a physical response level or a mental level, and I will never know what that's like. I'd love for everyone to eat bananas and meditate and breathe their stress response away, but I honestly know that everyone is different and that every body responds differently to stress. When we're looking at audition stress and performance under pressure, we're not just looking at isolated anxiety, but often a whole host of issues: lack of job, huge financial pressures, need for stability for spouse/children/ etc. If I (as a single lady of 28 with only a dog as a dependent) judge whether someone needs beta-blockers in auditions, I'm perpetuating this idea that people must have something wrong with them if they can't perform perfectly under pressure, and that's not fair to the true host of stresses of our career. The solution? I'd love to see orchestra auditions change entirely. I don't necessarily think that playing 7 minutes of orchestral excerpts is a good indicator of how one plays in a section (especially for strings), and I think hearing solo repertoire is often more telling that standard excerpts. (I'd also love for student loan situations to change in the US, especially in the arts). As classical music loses funding and audience, maybe it's time to rethink our harsh perfection oriented standards, and instead ask 'what makes a thoughtful musician?' The stress is not only for auditioners, but also for many symphonic musicians who play under intense conductors in high pressure ensembles. I'd love for a shot at an even audition playing field in which no one uses beta-blockers and there's a mindset of forgiveness for any initial shakiness. Until then, it might be time to check that harsh judgment of beta-blocker users at the door and look at the big picture issues. I've been in a movement challenge through the Liberated Body, and I've been thinking about the importance of resting in the course of the day. In the west (and in classical music) we tend to just go-go-go, and every time we feel tired, overworked, and exhausted, we refuel with caffeine. There's an expectation in music especially that we just have to keep practicing, keep auditioning, and keep stressing out all the time, and as you know from previous writings, that starts to affect the physiological function of your cells, internal organs, etc., courtesy of your sympathetic nervous system. How many musicians do you know that drink a teensy bit too much caffeine in an effort to just do more? Think about how most Americans work out/exercise: they don't move much all day (we live in cars, sit at desks,etc.) and then do the MOST INSANE WORKOUT EVER for 45 minutes or an hour. And then go sit again. What kind of yoga do most studios offer? HOT SWEATY (intense) flow and go. What's the problem with this? Our bodies need time to do the opposite-to decaffeinate, to stop moving so intensely (if that's our problem), to relax, and allow cellular renewal. Now I don't necessarily mean that you need to quit your caffeine altogether- I just want you to notice how much coffee/tea/etc. you drink, and if that's your first reaction when you're fading in energy level. Simple drawing of Alexander Technique's Constructive Rest position. How do we help out this cellular renewal and parasympathetic response? Simply put, constructive rest (which is similar to a yoga savasana). Constructive rest is an opportunity to lie down (floor, bed, couch, yoga mat) with the knees bent, eyes closed, and arms relaxed. Some folks prefer their hands on the belly or I prefer hands along side the torso. Constructive Rest shows up as a concept in many different movement modalities- yoga, Alexander Technique, physical therapy, and massage therapy, to name a few. -This triggers parasympathetic response, which can help with anxiety, stress, insomnia, etc. - Your psoas (AKA. your own personal filet mignon) has the opportunity to release. That doesn't have to mean anything right now, but just trust me, it's a good thing. - Your mind has the opportunity to slow down, and start noticing thoughts slow down. Combining breath awareness with deregulating action gives you a conduit to thought awareness. Let me make this clear- this is not a nap, at least not intentionally. This is active rest. When should you do this? Whenever you have time/space to do so, and you're energy is flagging. Maybe you're preparing nonstop for a recital, competition, or audition-make sure you're restoring every day! Maybe you have difficulties with stress and sleep-try this. SO many things in the body are benefited by taking time out to rest and de-stress every day, and in adding this to my self-care repertoire, I have more energy and sleep better. Want a detailed video on exactly how to do this? Brooke (from the liberated body) gives an awesome youtube video setup. Read more about constructive rest and Alexander Technique! What does a Beta-Blocker Do? So in the last few weeks, I've been busy (and stressed, too! ), but I've been thinking about stage fright, sympathetic response of the nervous system, and why things happen to us when we're nervous. Most musicians will at some point run into beta blockers as an antidote to stage fright- whether a colleague uses them or even a teacher, by adulthood, we have encountered someone who uses them for something not related to its initial prescriptive purpose. (Musicians are certainly not the only folks who use these-actors, presenters, etc., have been known to use them as well). Whether or not you take them, it's useful to know what the heck is going on if one does take them. First of all, a beta blocker is typically prescribed for folks with heart issues, arrythmia, and who need to lower their standing heart rate. It tackles the beta-receptors of the smooth muscles of the heart, kidneys, and sympathetic nervous system to prevent norepinephrine and epinephrine (adrenaline) from attaching to beta receptors, which ultimately encourages blood flow (as opposed to restricting vessels) and reduces overall heart rate. If that language didn't make things clear, let me simplify. Beta Blockers reduce overall heart rate and prevent adrenaline from playing its role in sympathetic response, AKA fight or flight. That means it reduces the physiological symptoms of sympathetic system, which affects breathing, fine muscle control, tremors, etc. While this may sound like a wonder-drug, there are a few things to consider. This is one of the most common BB's: propranolol. -Beta blockers are banned in the Olympics, but not in auditions. What would it be like if they were banned in auditions? It's a question I've pondered, because I think performance under pressure differs so widely person to person. It would even the playing field, whether that's a good thing or bad thing. -Beta Blockers only target the symptoms of panic, but don't address any of the psychological/somatic issues. If your anxiety is based in a constant fear of being good enough, or prepared, or talented, then BB's will only help so much. -Some people (audition committees/teachers/etc.) feel that BB's limit expressivity, spontaneity, and in the moment performing creativity, which is something to consider. If you regularly take them for performances and auditions, it might be worth wondering if you always need them. -The sympathetic response does have some benefits when you are in a stressful situation. Your response time is quickened, your brain is particularly focused, heart rate/blood sugars increase to fuel the body, and muscles tense up to provide speed and power. The whole point of sympathetic response is to support the body under dangerous conditions, so the changes that occur are meant to support. I realize that performance is not life or death, but it is an interesting physiological response to notice.